The best of the best go behind enemy lines in Activision's latest Call of Duty game. Activision's Call of Duty franchise is about the hottest thing in gaming, but it's still facing serious competition from the industry's other heavy hitters like Rage, Gears of War and Halo. To help maintain its competitive edge, Activision is revealing new details about the latest Call of Duty game, Black Ops. At E3 this year, the company is also demoing several new levels. The WMD level leads players through a wide range of experiences. You'll begin by strapping yourself into the cockpit of an SR71 Blackbird at Beale Air Force Base in California. In true Call of Duty style, the whole sequence is very cinematic, with all the sights and sounds that a covert sunrise launch evokes. Once the player takes off, which is itself a pretty spectacular moment, control passes to the surveillance specialist behind the pilot. Here players will use the technology aboard the Blackbird to scan a target location. You'll see your squad on the ground below, and lead them away from enemy patrols. As a vehicle column passes by, the squad seeks shelter in a nearby house. The trouble starts when a few vehicles stop at the house and the occupants get out and begin heading for the door. The observer in the SR71 instructs the squad to leave through the backdoor and hide out in the woods behind the house. The really thrilling moment comes when the perspective shifts to the squad in the woods. At this point, the player takes control of one of these agents. The transition really works nicely, and repays the investment in exposition. From here, things develop along the lines you'd expect from a Call of Duty game. The player has to infiltrate installations, capture or disable key bits of enemy equipment and generally try to stay alive in some very tense shootouts. Whether rappelling down to crash through the window of an arctic communication station or using a crossbow to take out guards on patrol, Black Ops sticks very close to the things that have made previous versions of Call of Duty so successful. For sheer awesomeness, it's hard to beat the Laos level. Here, the player and one other soldier have just escaped from a Vietnamese prison camp. They come upon a makeshift air base and, after using their M16s and grenade launchers to take out the enemy guards, commandeer a Hind and fly it downriver to extract revenge on the prison camp. Armed with a massive 12mm nose cannon and a seemingly endless supply of rockets, the Hind allows for some of the most amazing destruction we've seen in the series. 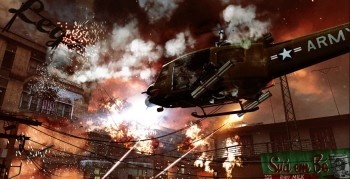 The player is in complete control of the helicopter, taking it up and down the river and using the rockets and cannon to take out bridges, guard towers, buildings, patrol boats, tanks, and, yes, even other attack helicopters. From start to finish, it's as action-packed a sequence as any Call of Duty fan could want. There are joys to be found at the other end of the scale too. To compensate for some early demo problems, the team opted to give us a little extra treat by showing off the intro to the Khe Sanh level. This bit, which picks up as the player lands in Vietnam in March 1968, showcases the developer's full performance capture methods. The convincingly lifelike interaction between the various characters here is way beyond simple lip-synching and arm waving. These characters show a wide range of nuance in their expressions and movement that takes them way beyond most of the digital characters seen in today's games. I have to say, Call of Duty has been more about iteration than inspiration for me, at least as far as the core gameplay of the last few titles has been concerned, but the scale of the action in the helicopter sequence and the amazing digital acting have put it high on my list of anticipated titles this year.